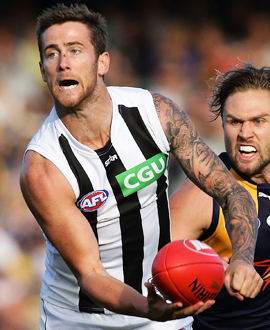 Exciting playmaker Jeremy Howe joined Collingwood’s young list in 2016 when the club secured his services in a complex four-club deal on day six of the AFL Trade Period. Collingwood, Adelaide, Melbourne and Port Adelaide were involved in the trade, which involved the Pies sending Paul Seedsman to Adelaide and Ben Kennedy to Melbourne in return for Howe and pick 68 in the 2015 National Draft. Howe played 100 games and kicked 80 goals in five seasons at Melbourne after being picked up with pick 33 in the 2010 National Draft. He enjoyed a fine first season at Collingwood, playing mostly in defence. With defenders dropping like flies, it was time for the high flying forward to be swung down back. It proved a masterstroke for both player and coach, for the new recruit produced some of the best football of his career. He averaged career highs in disposals and marks and regularly trusted his laser-like right boot to turn defence into attack from the kick ins.